As days draw near the most anticipated season of the year – that is Christmas – more and more people are rushing to find perfect gifts for the family, friends and loved ones. Choosing what presentss to buy for Christmas is as hard as moving through the rush of people who are doing their own shopping. Getting the right gifts for the right person is a different story. Luckily, we have HARNN, a leading Asian brand of body care and home spa products to make gift giving options an easier task to make. It arrived in the Philippine shores just in time for Christmas. Drawing its inspiration to the unique Asian holistic philosophy that the key to well-being, is to maintain the natural balance between the body, mind and environment, HARNN is one of the best Christmas gift one could receive this season. HARNN offers an array of skin care and hair care products, which includes gels, lotions, oils, hand creams, body scrubs, shampoos, conditioners, and many others, with different themes and aroma that is sure to fit different tastes and preferences. Oriental Herbs Collection suits best to those who likes aromatic herbs and spices. The sweet scent of Siamese Jasmine is captured in HARNN’s Jasmine Collection. East meets west with the concoction of lemongrass and lavender with their Cymbopogon Collection. 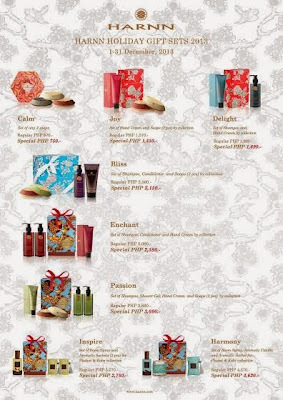 If you are into the exceptional fragrance of roses, nothing could go wrong with Oriental Rose Collection. Refreshing yet calming goes with Tropical Wood Collection with its sandalwood and orange blossom scents. HARNN also offers spa items that can be used at the comfort of your homes. HARNN’s Botanical compresses have unique therapeutic properties for relieving aches, muscle tension, minor skin ailments and improving circulation. Their Bath and Massage Oil Collection helps in sealing moisture in the skin and provide protection from the environment. HARNN’s Natural Rice Bran Oil Soaps and Aromatherapy Collection completes the holistic home spa experience, along with Vuudh, a collection of aromatic candles, fragrance sachets and room sprays that is sure to inspire everyone with its scents and Tichaa Herbal Infusion, restoring natural balance of the body from within. Get all these items at HARNN retail stores located at G/F Glorietta 5, Ayala Center, Makati City and 2/F SM Megamall A, Mandaluyong City. To know more about HARNN visit their website at www.harnn.com.